Contained in this month’s featured box is a gripping story of heroism and humanity. National Geographic Channel’s The Long Road Home isn’t just a macho war series padded with heart-pumping action scenes. It’s a well crafted drama about the soldiers of the 1st Calvary Division, their families, and the impact of war at home. 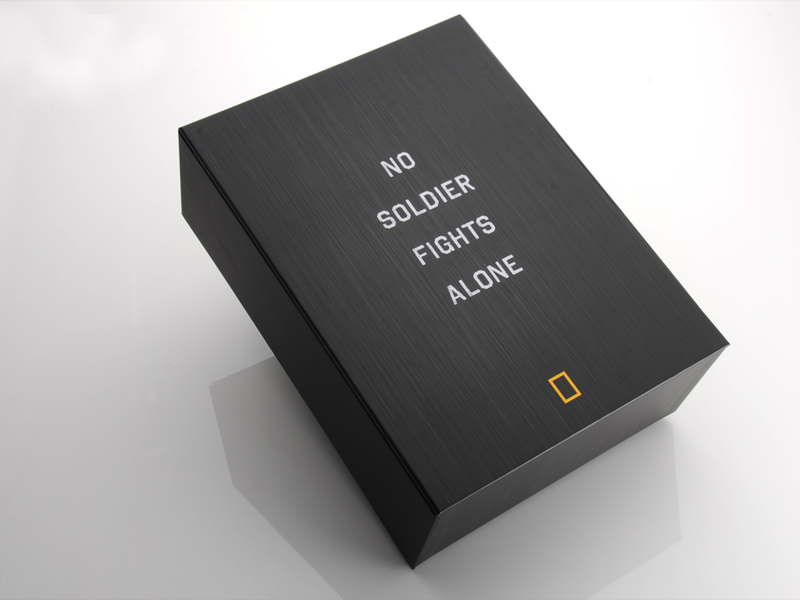 We were boxing up more than just a television series in this press kit packaging, but the lives of the real soldiers and civilians who lived it. Promotional packaging is a specialty of ours. We’ve done any number of press kits, influencer kits, sales, marketing, and media kits, and we love the creative freedom this genre of packaging affords. This box is a prime example of how expert packaging design, along with thoughtfully curated collateral, can create a comprehensive experience to thrill your audience. The Long Road Home is a 2017 National Geographic miniseries based on the book of the same name by ABC White House correspondent Martha Raddatz. The story examines the April 4, 2004, Black Sunday conflict in Sadr City, one of the first major combat incidents of the Iraq War. It’s a heavy subject, but National Geographic’s television adaptation is a gallant effort to pay tribute to the men and women of this story. 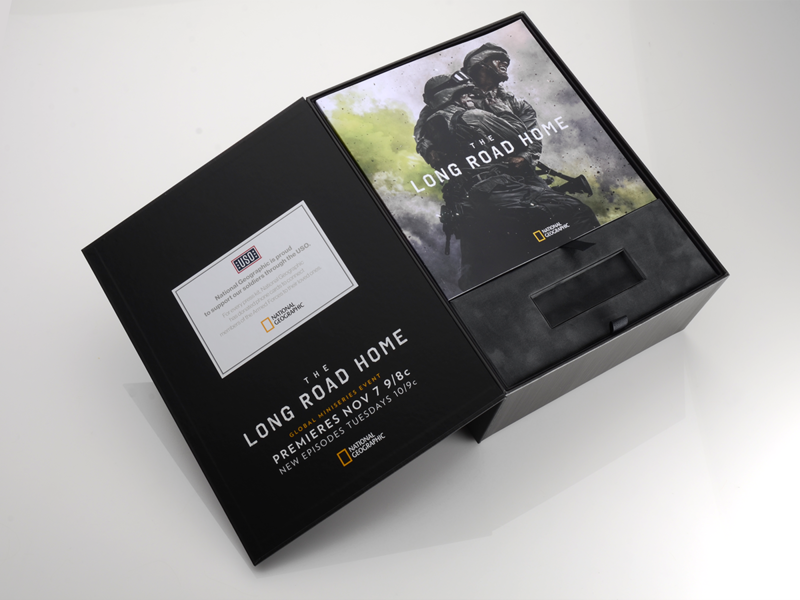 MADE by X LLC came to us to produce packaging for National Geographic’s miniseries The Long Road Home. The series is one of Nat Geo’s most ambitious ventures into scripted television. It was a massive undertaking, requiring the construction of one hundred unique buildings on a thirty-five acre site; the biggest television set in North America with production based at Fort Hood, Texas. The cast is stacked with recognizable actors (Michael Kelly, House of Cards, Sarah Wayne Callies, The Walking Dead) and the series was audited for accuracy by US military advisers, some of whom lived through the events of the series. (All told, there were some 600 military personnel and military families involved with production) Although this is a story of human drama, it’s hard to ignore the impressive special effects used in the series, including 5,000 detonators and 65,000 feet of wire used to cue the explosions on set. But how do you physically represent a television drama beyond the standard DVD/Blu-Ray packaging? How do you relate the gravity of conflict and survival while rewarding and exciting your audience? It’s a tough line to walk. A project of this magnitude needed a marketing effort congruous with the high caliber production, and so, a custom press kit was created to announce the premiere of the series. This project is a master class in how themed press kit packaging can convey the essence of a television series and inspire the audience to action without shying away from the nature of the subject at hand. The packaging wagers that the seriousness of the material will not turn audiences away, but draw them in even closer. And this is achieved through an artfully designed packaging experience. The stern appearance of this press kit relates a spartan feeling appropriate for a military motif. The combination of bold typeface and gray metallic printed paper immediately tells the audience what kind of box this is. 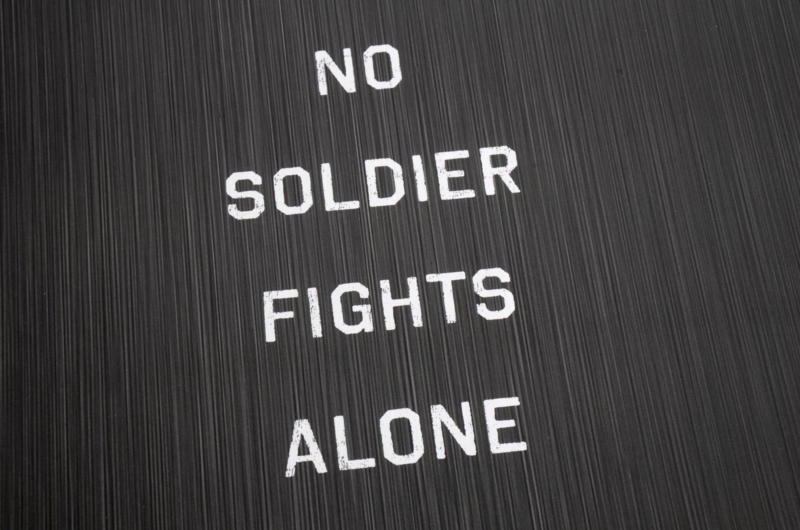 The phrase “No Soldier Fights Alone” appears in bold print along the front panel. This box has a steely exterior which could be mistaken for metal from a distance. Durable Eskaboard construction gives the box a rigid sturdiness which contrasts to the decidedly smooth feel of the exterior, thanks to 4C Matte Film Lamination. A matte coated wrap like that used on this box provides a rich tactile experience when handling the piece without the potentially distracting sheen and shine of a gloss lamination. Together, these elements of decoration instill a sense of reverent interest and set the audience up for the big reveal when opening the box. 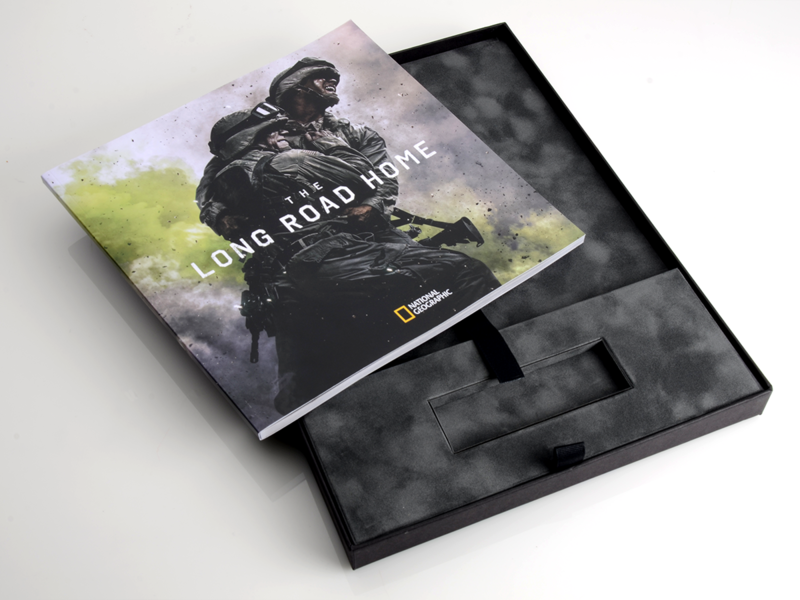 The box opens to unveil a compelling still photograph from The Long Road Home featured on the cover of a commemorative book housed within. It’s this heart wrenching scene of two soldiers that confronts the audience when they pull back the front panel, giving a visual representation to the phrase “No Soldier Fights Alone”. The gorgeous book, full of production stills, quotes, and facts about the production, rests on a custom insert shelf lined in Prestige Suede paper paired with a ribbon pull to accommodate the contents. This shelf also had a place for a one of a kind dog tag USB drive which contains all seven episodes of The Long Road Home. But that’s not where the experience ends in this press kit packaging. Beneath the shelf, there is a tray with a stash of branded military-themed swag including a duffle bag, baseball cap, and a t-shirt. The shelf is removable, allowing for some extra interaction as the audience explores the box. This design offers the audience several levels of play, with content to reward them at each step in the experience. And there’s one more remarkable feature to this box. On the reverse side of the front panel, you’ll notice a promotional announcement of premiere date of the show. But along with it, there’s a message from National Geographic in partnership with the USO. Each one of these boxes represented a donation of a phone card to a military family. While not every project that comes through our shop can be a philanthropic force for good, we feel it’s incumbent upon us to spotlight those boxes that serve an extra purpose. 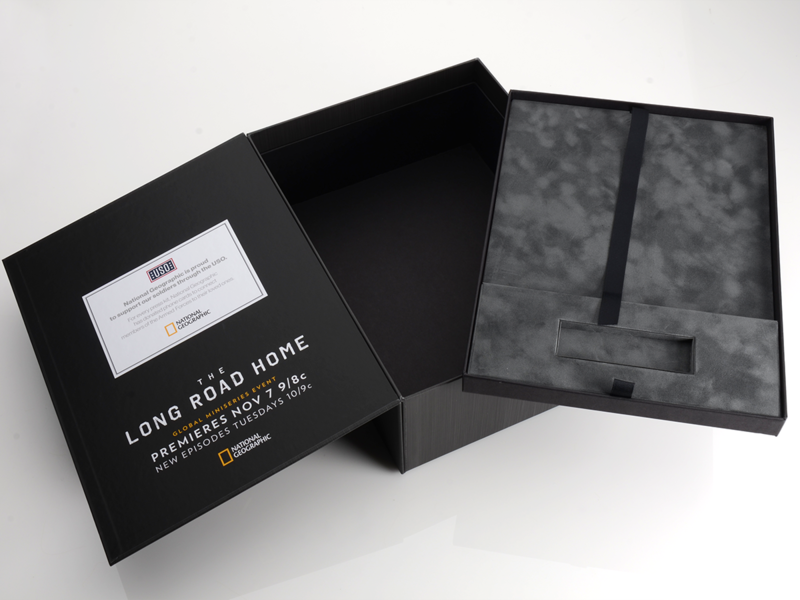 Whether it’s to highlight the quality of a new line of baby food or to battle for the Seven Kingdoms, press kits like this box for National Geographic tend to be some of our most creative and ambitious projects. A press kit is the ultimate opportunity for marketers and designers to flex their imaginations through packaging. No matter if the tone is sunny or serious, Taylor Box has the creative and practical capabilities to make a winning design for your project. Need press kit packaging for the big launch of your latest project? Get in touch with us today! Taylor Box is Headed to LA for Adobe MAX 2018!